Interfacing technologically important semiconducting surfaces, such as oxide-free, hydrogen-terminated silicon (Si−H) with functional films has appeared as a promising strategy toward efficient working devices for molecular electronics, catalysis and sensing. 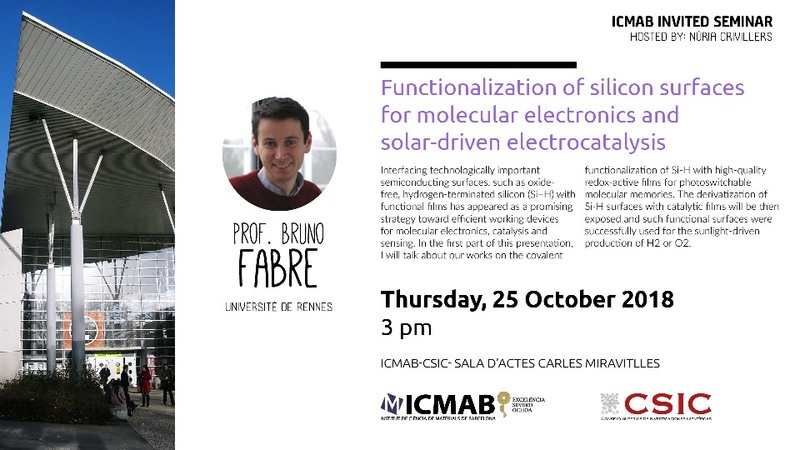 In the first part of this presentation, I will talk about our works on the covalent functionalization of Si-H with high-quality redox-active films for photoswitchable molecular memories. The derivatization of Si-H surfaces with catalytic films will be then exposed and such functional surfaces were successfully used for the sunlight-driven production of H2 or O2.